On Thursday, roughly 2000 runners competed at the St. Olaf Showcase in Northfield. Held on the famous State course, this meet always attracts fairly strong competition. However, the talent in 2018 was on another level, with multiple national caliber athletes and teams attending. And those matchups certainly did not disappoint, making for an extremely memorable season opener. The most anticipated showdown was the battle of three nationally ranked girls, as US#5 Emily Covert and US#12 Tierney Wolfgram played host to US#13 Lexy Halladay, who made the trip from Idaho with her Mountain View squad. After shattering the all time Minnesota 3200 record (10:01.68c) in the spring, expectations were even higher for Covert entering this season. Unfazed by the competition, Covert established the lead early, with just a few meters between her, Wolfgram, and Halladay through the mile. While Wolfgram would stay just a few strides behind Covert through the two-mile mark, Halladay would fade to roughly 30 seconds back of the two Minnesotans. It was Covert's finish to her race that proved most decisive, as Covert stretched the gap to over 20 seconds in her last mile and change to take the victory in 17:07.9. That time was roughly 23 seconds quicker than her Class AA State title winning effort last fall, destroying her own course record. 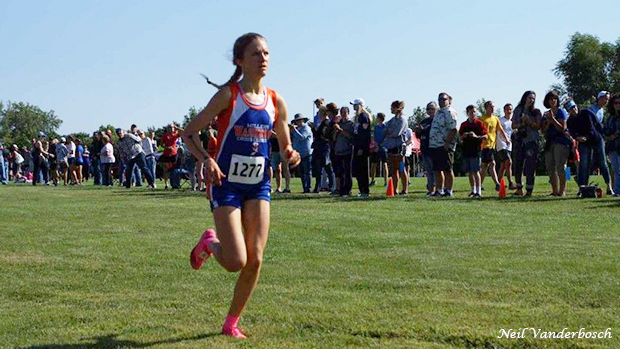 Though Wolfgram couldn't hang with Covert's blistering pace, her time of 17:28.3 was 3 seconds faster than her time at State last season, and was also under Covert's previous course record of 17:30.1. After notching Foot Locker All-American performances in 2017, it seems that both Covert and Wolfgram have never been as fit as they are now. Halladay would wind up in 3rd in a time of 18:21.6, as she is working her way back from injury and has yet to build up to a full weekly mileage load. Rounding out the top five were Emma Atkinson of Wayzata and Ali Weimer of Saint Michael-Albertville, the top runners from two teams with Nike Cross Nationals aspirations. The US#2 Wayzata girls returned their five scorers from a 7th place NXN finish, and looked unstoppable, placing 5 runners in the top 13 en route to a miniscule 45 points, 27 in front of St. Michael-Albertville's 72. The Trojans' frontrunning duo of Atkinson and Caroline Sassan looked as strong as ever, taking 4th and 6th. With the emergence of 8th grader Abby Nechanicky (3rd for Wayzata, 10th overall), the Wayzata girls already look like national title contenders. The fact that Wayzata was so dominant despite Lauren McCollor (their 5th runner at NXN last year) not even finishing in their top 7 is another indicator that this team is the strongest it has been since its upset of Fayetteville-Manlius in 2013. Perhaps just as big of a storyline was the impressive runner up finish by the St. Michael-Albertville girls. Weimer performed well as expected with her fifth-place finish, but Katie Sigerud and Mia Salas also broke out with strong top-15 finishes. Jessica Immer and Annalise Davis rounded out the scoring in 21st and 22nd. It was somewhat of a down race for Davis, who throughout much of last year was the leading runner for the Knights and is coming off a great track season where she achieved a time of 10:49 in the 3200m. St. Michael-Albertville's performance at St. Olaf might have established them as the 2nd best team in Minnesota, and possibly the Heartland region. And if Davis returns to one of the top two spots for the Knights, they should probably be favored to advance to NXN. The US#23 Mountain View girls took 3rd with 134 points, a solid first outing for the visitors. Camryn Pritchard, Kortlyn Lowry, and Adelynn Rosin created a formidable pack in the mid 19s in support of Halladay. However, the gap between Halladay and the rest of the Mountain View team was what hurt them the most. Both Wayzata and STMA had their top five finish before Mountain View had two cross the line. Though the boys race lacked some of the national level names that the girls race had, it did not lack any excitement. With no clear frontrunner, the course was packed throughout its early stages. A crowded lead group formed through the mile, with 33 athletes between 5:00 and 5:10. The pack stayed fairly close, with no one making any decisive moves until the two mile mark. At that point in the race, Caleb Haugland of Minneapolis Washburn began to make his move. With the pace becoming a little bit too comfortable, Haugland injected some speed to avoid the race coming down to a kick. With strong hill running in the wooded section of the course, Haugland held on for the win in 15:53.8, the lone sub-16:00 time of the day. Buffalo's Isaac Basten, the 2017 meet champion, would end up in 2nd in 16:01.2. 3rd Across the line was Eli Hoeft of Hopkins, whose strong performance proved that he's been underrated in the Class AA rankings. 7th-ranked Austin Streit of Mounds View opened up his season well in 4th, with Harris Anderson of Math and Science Academy representing Class A in 5th. It was a big showing from Anderson, who passed 8 runners in the last mile, including Class A's second-ranked ranked Emmet Anderson. He likely earned himself a move up in the rankings. In the team battle, the 5th ranked Red Wing boys made a statement, winning convincingly over three other ranked teams. The Wingers' top five of Weston Wyatt, Tom Nemanich, Tucker Wallin, Jonah Leise, and Bryan Zucker all went out fast, with each of them sub-5:10 through the mile. Although most of them fell back a few spots, they held their ground to all finish in the top 30. However, their 6th and 7th runner finished 79th and 120th, demonstrating how little room for error the Wingers have. Closing the gap between their 5th and 6th will be key to their postseason run. That being said, when their top five all have strong days, Red Wing looks like a podium team, as they demonstrated on Thursday. Mounds View, ranked 4th in Class AA, had a solid day to take 2nd. But if they wish to live up to their 4th-place ranking and potentially contend for the podium, they'll need some improvement from their 3-4-5 behind Streit and Lukas Hessini. 10th-ranked Winona could fall out of the polls after a 6th place finish, but unranked White Bear Lake and Hopkins both had impressive days (with Hopkins placing ahread of Winona by virtue of a tiebreaker). 6th-ranked Buffalo earned the 3rd spot in the standings behind Isaac Basten's great effort in 2nd. They'll want to close the gap between their 3rd and 4th runners to finish high at State. White Bear Lake finished 4th with 202 points, just 10 behind the 6th ranked Bison. Max Nelson, who could very well be their top runner, was just third for the Bears, showing a lot of potential for a team that was expected by many to be in rebuild after the graduation of their two low sticks. And though Hopkins will have a really difficult time trying to make it out of the Section of Death, their 5th-place finish showed that they can hold their own against some of the best teams in the State.